Doctor Who: The Moffat Scripts - THE GIRL IN THE FIREPLACE | Warped Factor - Words in the Key of Geek. Regardless, the story is wonderful in every respect. The pacing, acting, production and writing all hit the marks exactly right. It contains Moffat’s signature “timey-wimey” in all but name but doesn’t let the story get dragged down because of it with the beginning middle and end all clearly defined. And then there's the clockwork droids. These are what provide the villain role here. After their spaceship breaks down they set about repairing it… and among the parts they use are body parts of the crew – nobody said they weren’t on the menu. With the crew gone they believe only the 18th century monarch will be satisfactory in getting the job done and fixing the ship completely, so they literally punch a hole in time in order to go find her, visiting her at different stages of her life until she is at the right age for their purposes… and then they seek to take her head. 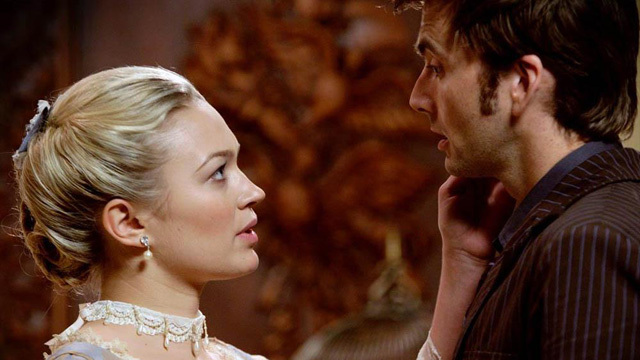 But the real meat of the story isn’t in them, no, it’s in the love story between the Doctor and Reinette. The first time he sees her is just as a child and then he keeps dropping in as she grows older and embarks upon a romance. The saddest part? For him it’s less than one day but for her, a lifetime. It’s a trick Moffat would pull again with The Eleventh Hour in which the 11th Doctor is less than a day old yet has completely changed Amy’s life. But we’ll discuss that when we get there. But this is a Moffat script, so while the clockwork droids are scary enough you need some set pieces to terrify the kids as well, and this story succeeds there! The moment when you realise there’s a ticking sound even though the clock is broken is a spinetingler, and the scene when Rose and Mickey are held captive by the droids while the Doctor’s not present is edge of your seat stuff, yet the episode never goes too far into behind the sofa territory beyond these two occasions. Moffat showed us his capacity for that with his previous RTD-era effort, The Empty Child/The Doctor Dances, and with his next one, Blink, he shows us how to truly explore the capabilities of time-travel. After that, with Silence in the Library/Forest of the Dead, he’ll do something to set up his own tenure as showrunner. 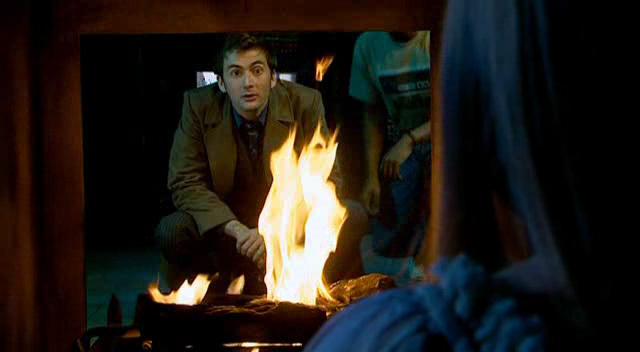 But this time with The Girl in the Fireplace he’s not out to make us think too hard or to scare us or tease us, though he does all of these things, this time he wants to make us cry… and I’m not afraid to admit that he succeeds. And the audience cry their eyes out. 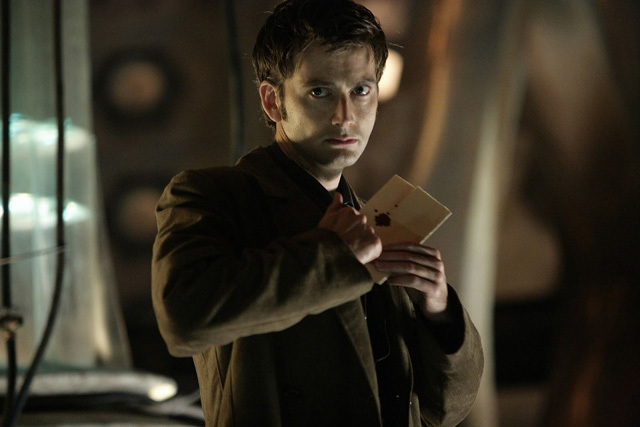 She leaves him a letter, and as the episode ends we see him read it. Tennant doesn’t portray a sad Doctor here but gives a sombre performance which serves to make the scene sadder because he’s bottling up his emotions, not even letting Rose and Mickey know how sad he’s feeling. 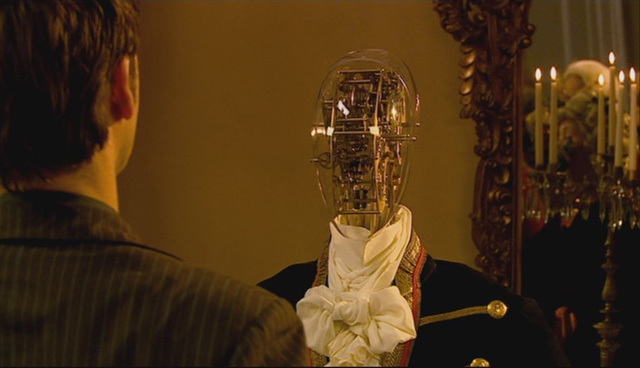 And it’s here that the true genius of Moffat’s idea is brought to the forefront: after the TARDIS leaves we see the spaceship was called SS Madame de Pompadour, and if that isn’t a terrific way to end the story then I don’t know what is. The bizarre events that don’t make a lot of sense suddenly being explained and tying up the plot in a neat package. What more could you want? As the credits role you’re left an emotional wreck, both cheering for Moffat’s writing and crying for the Doctor’s heartbreak at the same time. Are there any other shows on TV that can make you experience both extremes of the emotional spectrum at the same time? Are there even any more Doctor Who stories that can do that? I doubt it. So do I have any criticisms? I guess there’s a few things I could pick up on, like the faking drunk Doctor scene being a little bit too silly or the convenient inability to use the TARDIS, and I don’t feel that Mickey really adds anything other than someone for Rose to say her lines at. I’m also not sure why the Doctor thought he could get back on time to take Reinette with him since, if his experiences taught him anything, it’s that he was wrong about that, but really that’s just me nitpicking. The Girl in the Fireplace is a great story, and that Moffat can put his name to a story like this is certainly something for him to be proud of. These 45 minutes of television are a towering achievement and an episode to be watched and rewatched time and time again. Just ignore the fact that it’s essentially about the Doctor grooming a little girl and you’ll be fine.